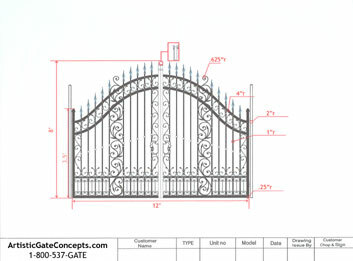 ArtisticGateConcepts.com provides customers with a truly unique opportunity to turn imaginative gate concepts into reality. 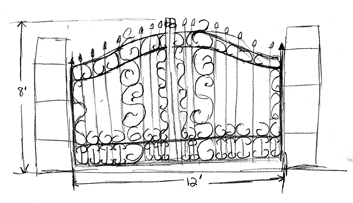 The process begins when a customer sends in a picture, drawing or "napkin design", of the gate as he/she imagines it. We will work with our customers to get all the necessary details for manufacturing including length and height, preference for material, color preference, and any other artistic design detail essential to realizing the gate of their dreams. Email us your custom design at sales@artisticgateconcepts.com, Outlook users click here. Next, our experts take the napkin design and turn it into an AutoCAD rendering. AutoCAD (Computer Aided Design) is the computer generated design program used by professional architects and draftsmen for both 2D and 3D design. The AutoCAD rendering allows our professionals to ensure that the design is structurally sound, and to create a nearly seamless transition from design to realization for our crafters. The AutoCAD image is sent to the customer for approval, and once approval is met, it is on to the final step. Lastly, the crafters take the AutoCAD rendering and construct a gate according the specifications. When the gate is completed, it is shipped directly to the customer's home for installation. Customers will have constant knowledge about the progress of the gate through e-mails concerning the shipping and tracking information of the completed gate. 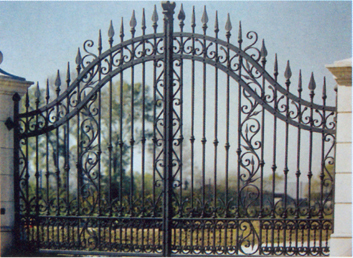 Upon arrival, the gate can be installed by the customer or a professional. And so, the reality of the concept is finalized.